Deceuninck-Quick-Step's Julian Alaphilippe has taken the victory at Milano-Sanremo. The Frenchman was the fastest at the final reduced sprint and took the first Monument victory of his career. The first Monument of the 2019 season was 291 kilometres long between Milano and Sanremo, which was around seven hours on the saddle for the peloton. The escape of the day was formed in the first part of the course and included Joonas Henttala, Charles Planet, Andrea Peron, Umberto Poli (Novo Nordisk), Alessandro Tonelli. Mirco Maestri (Bardiani-CSF), Fausto Masnada (Androni Giocattoli-Sidermec), Sebastian Schonberger, Luca Raggio (Neri Sottoli-Selle Italia) and Guy Sagiv (Israel Cycling Academy). The front group managed to get an advantage of more than eight minutes over the pack but were caught at around 20 kilometres to go, as they climbed the Cipressa. With 19.8 kilometres to go and on the descent of the climb, Direct-Energie's Niccolo Bonifazio launched a strong and risky attack and managed to build a gap with the pack. The Italian reached a speed of more than 78 kilometres per hour at some points. The speed of the pack left behind sprinters like Dylan Groenewegen (Jumbo-Visma) and Nacer Bouhanni (Cofidis) but they managed to rejoin the peloton some kilometres later. The adventure of Bonifazio finished with 11 kilometres to go, and right away CCC Team, Katusha-Alpecin, Deceuninck-Quick-Step and Bahrain-Merida took the position in front of the pack just before the start of the Poggio climb. Philippe Gilbert and Zdenek Stybar took the lead of the bunch at the climb and set a high pace to force a selection for their teammate Julian Alaphilippe. Simon Clarke (EF Education First) was the first man to launch an attack and was closely followed by Alaphilippe. Moments later they were joined by Peter Sagan (Bora-hansgrohe), Michal Kwiatkowski (Sky), Wout van Aert (Jumbo-Visma), Matteo Trentin (Mitchelton-Scott), Oliver Naesen (AG2R La Mondiale) and Alejandro Valverde (Movistar). Moments later, Tom Dumoulin (Sunweb) and other riders joined the front group. With two kilometres to go, Trentin launched an attack but one kilometre later the others had closed the gap. Sagan was the first rider to launch the final sprint and Alaphilippe followed. The pace of the Frenchman was unbeatable for Naesen and Kwiatkowski, who had to settle with the second and third positions, respectively. Sagan and Bahrain-Merida's Matej Mohoric completed the top five of the day. 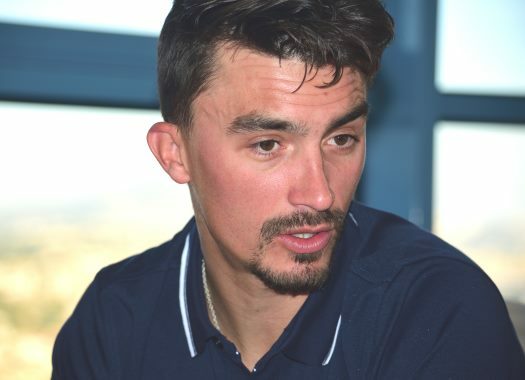 This is the first victory in a Monument for Alaphilippe who as such continues an impressive season in which he has also won Strade Bianche and took stage wins at the Vuelta a San Juan, the Tour Colombia and Tirreno-Adriatico.